As part of building the ontology for capturing knowledge about HIV and AIDS, I came across UNAIDS’ Terminology Guidelines document. The document presents preferred terminology for discussing matters on HIV and AIDS. For example, response to AIDS is the prefered alternative to fight against AIDS. On Thursday, I sort of told Lorenzo (one of my supervisors) that I tend to stray a lot while in cyberspace. To my defence, the internet is such a huge huge place and it is pretty difficult even with best intentions not to stray. Anyway, whilst I was straying I came across an interesting article on Behavior Change Communication (BCC) for HIV/AIDS from the Family Health International (FHI) site. “The following steps incorporate careful analysis, feedback and redesign throughout the entire process. Step 1: Identify the problem based on the overall program goals. Step 2: Segment target populations. Step 3: Engage in formative research. Step 4: Identify behavior change goals. Step 5: Seek consensus from stakeholders. In my last post (over a month ago), I was more or less using photography for inspiration. I am not a photographer. However, I am a habitant of the technology world (but neither a geek or a technophile) and as such, I have a duty to advocate for the use of technology in bringing about social change. Today, by some fluke, I came across a blog on “How to Use Social Media for Social Change“. 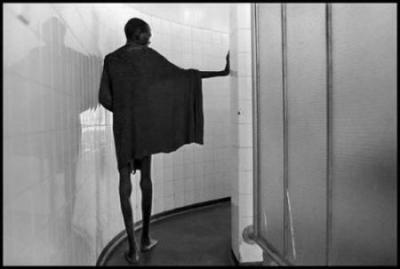 This blog moved me in almost the same way the photograph by James Nachtwey moved me. When I saw that photograph, one of my first impressions was: ‘something needs to be done; the man is practically walking next to his own shadow but in fact he is himself a shadow of his former self because of HIV/Aids’. I derailed a bit, the point is, we members of the tech community need to rise to the call! We need to do something to bring about social change. We have a responsility to ensure that people don’t die due to HIV/Aids; lack of clean water and sanitation; hunger; etc. A picture is said to say a thousand words. Below is a picture that resonates so much with what we would like to prevent – people moving into the corridor of death by Aids. This picture was taken by a renowned photojournalist and war photographer, James Nachtwey, just two days before the man met his fate. Looking at it from this context, I hope it is easy to see why the words “corridor of death” are associated with the picture. Further, I hope that this piece of fine art evokes enough emotion to cause each one of us to participate in the fight against HIV/Aids. For true admiration of the original work visit James Nachtwey’s gallery .